It seems like every year we get a new Pokemon game – or two. Since 1998, we’ve had approximately 24 games released in the core series, which is not only comprised of dual versions (ie: Red/Blue, Gold/Silver, etc); but also amalgam games (ie: Yellow, Crystal, Emerald), direct sequels (ie: Black & White 2) and remakes (FireRed/Leaf Green, etc). It’s hard to imagine all of these games – sometimes with conflicting stories – could be part of the same universe. Though with many games making references to past installments – such as how Gen 1’s protagonist appears in Gen 2 as the Pokemon League Champion – there must be some shared universe… or rather, Multiverse. This is exactly what Pokmeon Omega Ruby & Alpha Sapphire (ORAS) and its post game The Delta Episode confirms. So what is a Multiverse? How does it fit into/explain all the various Pokemon games? What’s the evidence for all of this? These questions and more shall be answered as I turn my analytical skills away from Film & Television and into the deep recesses of Pokemon Poke-Theory. Put VERY simply, the ‘Multiverse Theory’ states that there is an infinite – or finite – amount of parallel universes that exist outside of our own. The idea behind this basically feels that if the universe is infinite, then sooner or later it must start repeating at some point since the number of ways particles and events can be arranged is finite. So at some point, there’d be someone who looks like you. At another point, there’d be someone who looks AND acts like you. And further down the line, there could be someone who looks and acts like you; but decided to wear a hat this morning. Now that last example is a little hyperbolic; and I’m nowhere near equipped to run through ALL the repercussions and hints at a Multiverse in our own universe. So what you should take away from this section is that the Multiverse Theory claims that there are various other worlds in which things took a path slightly different from our own world (ie: American Colonies never won independence from Britain, WWII never happened, etc). In Pokmeon ORAS, the post game sequence known as The Delta Episode reveals a ridiculous amount of information about the Pokemon Universe; but for this article we’ll only concentrate on one revelation – Multiverse. So let’s set the scene! In order to stop a massive six-mile wide asteroid from decimating all life on the planet, scientists at the Mossdeep Space Center plan on using something called Infinity Energy to teleport the Meteor away. This is when Zinnia – one of The Delta Episode’s antagonists – appear and claims that saving the world like this could be “the worst tragedy imaginable for some other world”. Now Zinnia also seems to be hinting at a connection between Mega Evolution and the Kalos Genocide Machine – part of the Pokemon XY story -; but that’s a huge article for another time. The main point here is that there is another version of Hoenn out there that doesn’t know of Mega Evolution or massive Meteorites that strike every millennium. So to put it simply and prepare us for the next segment of this article: Zinnia is saying that saving the world of Pokemon ORAS could destroy the world of Pokemon Ruby/Sapphire/Emerald – the Generation 3 games that Pokemon Omega Ruby & Alpha Sapphire are remakes of. Okay, so thanks to Zinnia’s speech at the Mossdeep Space Center, we can say – at the VERY least – that the Pokemon games prior to Pokemon XY (Red/Blue-> Black/White 2) exist in a world separate from Pokemon ORAS & XY because they lack Mega Evolution. Now this isn’t to say that the Kalos Region doesn’t exist in the ‘Pre Pokemon XY Universe’. For example, Johto (Pokemon Gold/Silver/Crystal) might not have been mentioned in the original Kanto-centered Pokemon Red/Blue/Yellow; but we later learned that the two regions existed side by side divided by The Indigo Plateau. Similarly, Kalos exists in the Pre Pokemon XY Universe; but the Kalos Genocide Weapon – or whatever is responsible for Mega Evolution – does not. That’s one fragmented universe; but as the original Multiverse Theory states, there could be an infinite number of parallel worlds out there. Now there’s no way I can prove infinite; but Pokemon ORAS does reveal the presence of more than just a World Without Mega Evolution (pre Pokemon XY) and a World With Mega Evolution (post Pokmeon XY). In fact, this evidence will not only make this game make sense; but also help explain ALL previous Pokemon games. Once you’ve completed The Delta Episode and head to The Battle Resort, you will bump into Team Aqua – or whichever team was trying to help you during the events of the game. So in Omega Ruby, you will bump into Archie (the Leader of Team Aqua) and two of his Admins. After a brief catching up, Archie will wonder if things could have happened differently. 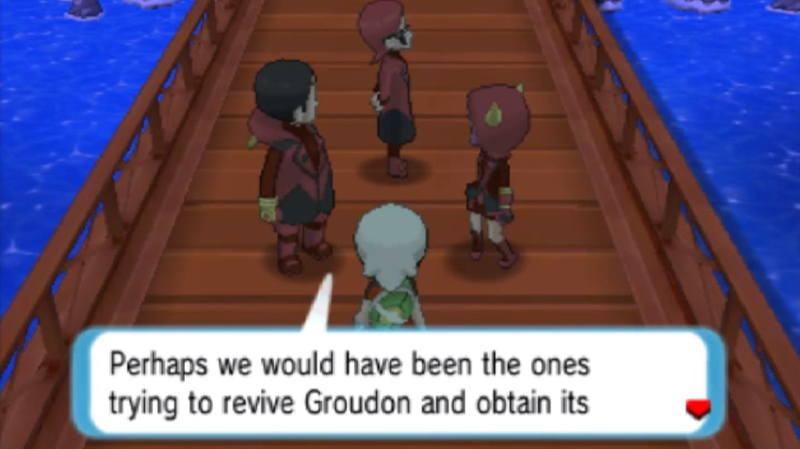 Could there be a world out there where instead of Maxie and Team Magma trying to revive Primal Groudon, Archie and his team tried to revive Primal Kyogre. As you know – or can imagine – this world does exist and it is the world of Pokemon Alpha Sapphire. This conversation with Archie clears up years of confusion and conflicting game stories. Pokemon Red/Blue were exactly the same story wise; yet Pokemon Yellow granted you a Pikachu as your starter and subsequently gain the original 3 starters in your quest. Pokemon Gold and Pokemon Silver were also basically the same; but Gold saw Ho-Oh awaken first whereas Silver had Lugia awaken first. Similarly to Pokemon Yellow before it, Pokmeon Crystal had some similarities to the previous Gen 2 games; yet had key differences with the Legendary Pokmeon Suicune. This style not only continues for every game after; but also grows more apparent in Gen 3 where each game version has a different team trying to revive a different Pokemon. So basically, each Pokemon game – with a few exceptions of course – could be its own Parallel World. Though as I mentioned at the beginning, we have seen connections between different Generations of Pokemon games. 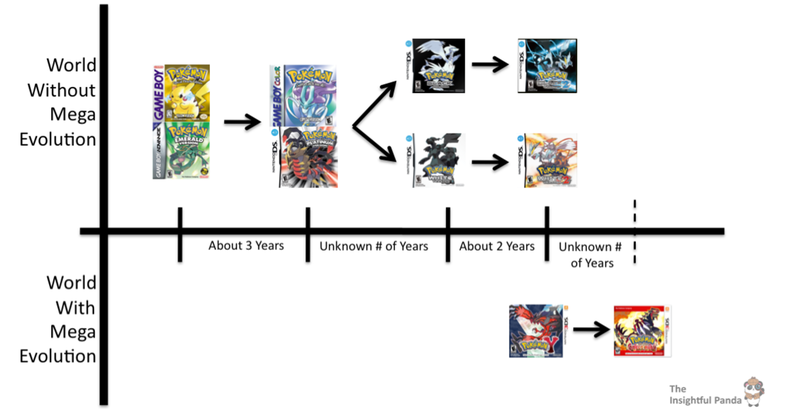 Each game might represent a different course; but we also have to account for the timeline of these Pokemon games – if one exists. Thankfully a tweet from Toshinobu Matsumiya – one of the lead game heads since almost 1998 – revealed that there isn’t only a timeline for the Pokemon games; but also how each generation fits together. IF this tweet is legit, then this veiled tweet would translate as the Kanto stories (Red, Blue, etc) taking place concurrently with the stories in Ruby & Sapphire. 3 Year later, the events in Johto (Gold, Silver, etc) would take place along with the stories in Diamond & Pearl. After an “unknown amount of time” Pokemon Black & White take place followed approximately two years later by Black & White 2. While B/W2 was going on, Pokemon XY would also be happening. This timeline could lead to a number of different permutations since we previously learned from Archie that different versions can constitute different universes. To put this simply: One universe could be Yellow and Ruby taking place simultaneously leading into Pokemon Gold; while another could be Yellow and Sapphire leading to Gold. For simplicity purposes, the above example doesn’t even take into consideration Diamond/Pearl, Black/White, etc; but you can already see a ton of different options forming. Since Red’s team in Gen 2 contains all 3 starter Pokemon and Pikachu, it makes more sense to maintain Pokemon Yellow as the starting point; but Pokemon Gold could just have easily have been Silver or Crystal. Even if we were to make the CORE Pokemon Timeline – that is the timeline composed of the most complete stories – we’d still have a divulging of parallel universes once we hit Black & White since there is no Gray version which combines both stories such as the past versions did. Are you still with me? Take a moment to reread if you must; but the main thing to take away here is that when there are conflicting versions (ie: Ruby & Sapphire, Black & White) these are all parallel universes that can be factored into the timeline. Additionally, we must remember that the parallel universes are grouped into one of two LARGER types of Universes – universe without Mega Evolution and one with Mega Evolution. So despite the “Matsumiya Timeline” saying Pokemon XY takes place concurrently with Black & White 2, Pokemon XY is STILL in a different parallel universe because it has Mega Evolution and the previous 5 Generations do not. All in all, this Multiverse revelation is how Pokemon wants to explain Mega Evolution and why it didn’t exist in the prior five generations. Rather than admit “so what, we had a new idea”, they decided to use the Multiverse Theory to explain it away in a much more elegant – albeit confusing – manner. Since we are currently in the Mega Evolution Universe (XY & ORAS), we should actually take a moment to just explain what this world means. Just because the first five Generations of Pokemon don’t exist in this universe, that doesn’t mean that Kanto, Johto, etc don’t exist in this world. Just like how Kalos would exist in the Pre-Pokemon XY World despite it not being mentioned, these other regions of course exist in the Post-Pokemon XY (Mega Evolution) World despite not being mentioned yet. 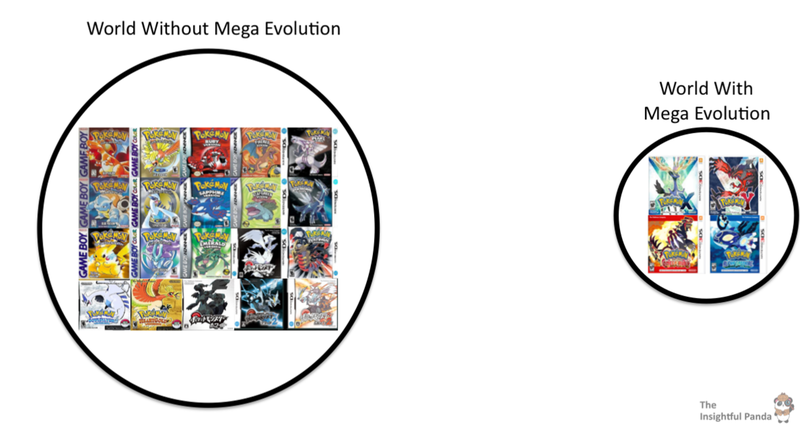 It’s a pretty safe assumption that Pokemon will not only continue to make new games in the Mega Evolution Universe; but will also bring some of the old regions into these games. How Kanto and Johto will be brought in considering we’ve already gotten Gen 1 & 2 remakes (FireRed & LeafGreen, HeartGold & SoulSilver), remains to be seen; but these lands do exist. The real question is if the “Matsumiya’s Timeline” still holds true. He said Ruby & Sapphire take place many years before Pokemon XY; but that doesn’t mean Omega Ruby & Alpha Sapphire do. The Mega Universe is very different and might hold a completely different timeline considering Pokemon ORAS seem to take place AFTER Pokemon XY. In Pokemon ORAS, Mega Evolution is a much more widespread occurrence whereas in Pokemon XY its an exceptionally rare thing that only a handful of Pokemon and Trainers have access to. Now yes, Pokemon ORAS was released after XY so that explains all the additional Mega Evolutions; but who’s to say that also doesn’t mean ORAS comes after XY story wise. Though if you want an added reason, you must simply travel to Slateport where some of the ship builders speak of building a ship using Kalos’s High Speed rail technology. If people in ORAS plan on using some of Kalos’ cutting edge tech then there is no way ORAS can take place – at the very least – 6 years before Pokemon XY. Whether ORAS comes after XY or these two games are concurrent to an extent, there are drastic differences between the Mega Universe Timeline and the Matsumiya’s (Normal) Timeline. As for where the series will go after this, probably a Mega version of Diamond/Pearl OR a new Black/White since we see The Royal Unova – the transport ship in Gen 5 – being built in the shipyard in ORAS. So despite Black&White not taking place in the Mega Universe yet, they – and other game additions – will probably take place after XY and ORAS. So there you have it folks. I hope I didn’t lose any of you there; and if I did, I hope you found your way back easily enough. What’s important to remember is that this is a universe that is constantly changing and growing by our own devices – or rather the people behind Pokemon. The Multiverse Theory is a fun and dynamic way to reconcile all of these different yet connected games; but you shouldn’t expect a massive Multiverse Map spelling out all the different possible parallel universes out there. With each new Pokemon game – not to mention the anime and spin-off games – the Multiverse will grow bigger and bigger. So at the end of the day, just go enjoy your Pokemon games and this wonderfully deep answer to over 15 years of gaming. If you have any questions, sound off in the comments below and stay tuned for our next Poke-Theory article. I Enjoyed this read though an aspect of OR/AS exists that’s absence cannot be explained in R/S/E: Primal Reversion. The topology already indicates that both worlds had meteor impacts, meaning that similar elements must exist. 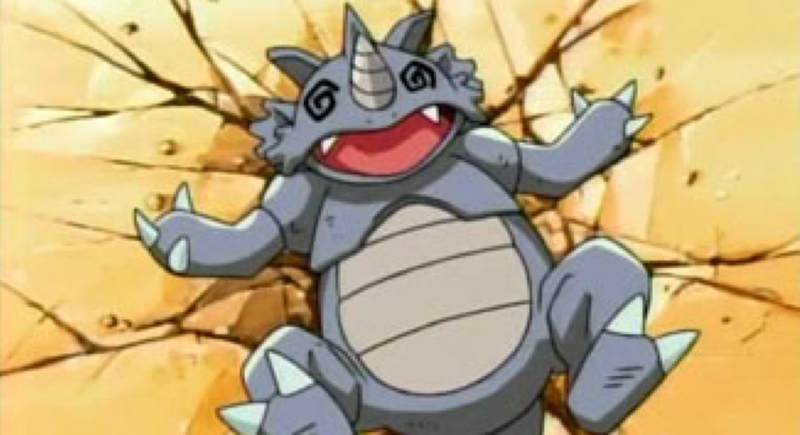 If the Primal Pokemon are in fact the true forms of the two, and if mega evolution never came to fruition, then the two fought in R/S/E have no reason to NOT be in their primal forms. The only explanation would be that there is not enough natural power in R/S/E to cause it. On the other hand the idea of events being displaced between the worlds: XY -> OR/AS, R/B/Y = R/S/E, is supported by the “Time Traveler’s Award”, awarded for bringing a Pokemon all the way from R/S/E, to OR/AS, with the pokemon said to have traveled very far through spacetime to it’s destination. so glad you enjoyed the read 😀 And Oh wow, great point! There is literally so much to take into account with these theories, i forgot about Primal Reversion. Then again, i think you might have it right with the ‘not enough energy of nature’. If that comet that collided in Sootpoolis did have natural power that drew Groudon and Kyogre to take a primal form, perhaps that explains how Primal reversion started as well – or at least became plausible. Game Freak wanted to explain the biggest question of pokemon for twenty years. If you think about it, the pokemon universe does not have a real storyline. In one story, the main character chooses Fenniken as his starter, while in an other story, he chose Froakie instead. In fact, every game file is a separate universe. In one universe, the main character caught this pokemon while in another, the same person did not. When we trade pokemon, the worlds link together. And when a certain pokemon goes into a different dimension. (game) They evolve. This explain how pokemon evolve by trading. GOD I love talking Poke-theories with my readers. I never thought of that but it makes so much sense! Just want to add in that this has some more in-game support than one might think at first. Using Memory Link in Black/White 2 you can make the specific dimension your Black/White game takes place in be the same one that your game of Black/White 2 takes place in. In particular, depending on which starter you chose in Black/White, Cheren and Bianca will have the appropriate starters in response. Alright. I have a theory for you. What if, each and every save game file in OR/AS and XY ISN’T another parallel world? What if they’re all the same world, and each game is just one person’s adventure IN THAT SAME WORLD? Let me try to explain as best I can. OR/AS Has the PSS, So does XY. How could it be that two people from alternate universes come together to fight over the PSS, as we’ve seen Quantum Manipulation doesn’t exist in Pokemon (Well minus Ash being ten for 20-something years, but I digress) Therefore, what if each XY game is just another trainer, in a gigantic world? And the reason we don’t see other characters in our world is because we are all at different stages on our journey. This is even more reinforced with OR/AS. They allow Secret Bases. And you can see other people’s secret bases. Now, again I bring up Quantum Manipulation. HOW IS IT that people in separate universes can come into our universe (Our copy of the game) And make physical objects? And how is it that using the DexNav TV, that we can tell what’s going on ACROSS Universes? This, to me, suggests that each copy of OR/AS, and XY is not just it’s own alternate universe, but simply chapters of the same book. You get what I’m saying? The Only Thing that this theory fails to explain is how multiple people can have multiple Mascot Legendaries. (Kyogre, Groudon, Rayquaza in OR/AS Xerneas, Yveltal and Zygarde in XY). But the free flight aspect of ORAS does say how we can have multiple of Gen 1-5 Legendaries. The Black Portals serve of Quantum Rifts. (And these are naturally occuring anomalies, not man-made like those needed for trading, battling over PSS and DexNav.) Therefore, these Quantum Portals reach into the Multiverse Copies of Gen 1-5. Therefore, everyone gets their own legendary. I do realize that this theory has a few holes in it (LIke why would Archie and Maxie try to resurrect a pokemon they already resurrected, I know that) But it’s still something to think about. You do bring up an excellent point. The states of games of the same version must be the same universe for those reasons as well as in-game trading. We’ve seen in the anime and game people who trade in this same universe with you. Every game you play is probably YOUR journey in that universe. As for different journeys or save files basically what it is, a redoing of your journey – something we can’t ACTUALLY do in real life. As for other players, those are their journeys in the same universe it would seem. OR maybe the different universes are also relative to each player. Like each Final Fantasy (i.e. 7) has universe, yet each player playing isn’t a separate universe. It is just their progression through this preset universe. Oh man, my brain hurts. I think the Multiverse Theory for Pokemon can hold up as far as game story arcs are concerned; but once we venture into the world of different save files or other players, then things fall apart. Not really, when you consider the fact that we have pokemon who are KNOWN to have the ability to travel through and manipulate both Space and Time. You’ve got that wrong! Sort of. The meteor heading to r/s/e, it actually would’ve headed to another universe, almost exactly like your or/as, only with some changes, like you said. But if all this is true, how did the meteor get to (players name) universe? It’s quite simple really, it was sent from another universe, who chose to send it to (players name) universe. It would go in an endless cycle, until somebody stopped it. You. You stopped the cycle, by destroying the meteor. Well remember, Zinnia said it could go to a world where Mega Evolution didn’t’ exist, and thus no Mega Rayquaza and thus no way to avert the disaster. That would spell out more the original R/S/E since it was pre-mega evolution was introduced. Game details also confirm the existence of alternate Hoenns. In R/S/E, Mauville City’s Wattson states “I’ve given up on my plans to convert the city, I have.” In OR/AS we see a completely renovated Mauville, infering that Wattson in this universe decided to “convert the city” afterall. Before battle he even tells the player “The plans to reform Mauville are done for now” Further study reveals that while both regions have a Sootopolis City, the means by which they were created differs. In R/S/E Sootoplis was created when a hollowed out volcanic crater filled with rain water, and was settled by people. In OR/AS we are told that Sootopolis came into being via a meteoroid impact crater which, like it’s R/S/E form, filled with rainwater and was settled by people. Thus we can see that while both regions are similar, they are not the same, further supporting evidence provided by Zinnia. *mind blown* Spectacular points! Great connections Gyaosblade! The Pokémon Multiverse is VERY weird, especially when it has to explain which games are in what timeline and when those game happened. I think for ORAS and X/Y that ORAS happened before X/Y chronologically, but just by a few months at least. Why is this? Well, to start things off, there is the character called Mr. Bonding, which gives you O-Powers in X/Y, and (eventually) in ORAS. Why is he significant? Well, in ORAS, there are these different men, each sporting different colors, and they give you O-Powers if you talk to them in the Mauville City Pokémon Center. Once you talk to all of them, you go visit a certain house there, and they will all be there, surrounding a regular Clerk NPC. They will then FUSE with that NPC, and the result is Mr. Bonding (honestly one of the weirdest events in Pokémon history). Mr. Bonding then tells you that he will “travel the world,” which is probably why he ends up in Kalos, and he is already Mr. Bonding when you first meet him in X/Y. This is the reason why I think X/Y comes after ORAS. I will say that it X/Y happened a few months, or even no more than a year after ORAS because of the classification of Mega Evolution. In X/Y, they state in the game that Mega Evolution is a new concept that is undergoing research, thus causing it to be unknown to most other parts of the Pokémon World. You could say that ORAS came after X/Y since the concept of Mega Evolution seemed to undergo development there first, but ORAS must come before X/Y, all because of Mr. Bonding. Ohh, great point. Yah, that is pretty good evidence. Then again, if Mr Bonding can bond, maybe he can defuse too. Like Gotenks or – if i was to stay in the same universe – like how Black White Kyurem can be fused then split up. Ugh, my head hurts lol Regardless, excellent point ArmorGeddon! I think the assumption that causes most headaches here is that there are parallel universes with/without Mega Evolution. Assuming there are, for the most part, these 2 worlds, ORAS would have to happen after XY due to the developments concerning Mega Evolution, but several things point towards a timeline of ORAS -> XY. The only reference in the other direction is the existence of the genocide machine, but we know it has been activated in the past, so its existence would be known either way. Now notably, Mega Evolution is introduced in XY as something new that was recently discovered, while in ORAS it’s pretty much regarded as normal. The Multiverse is also referenced in ORAS only. Here’s the thing: I believe the timeline looks as follows (= means simultaneous, / means parallel universes, > means later): R/G/B/Y/FR/LG = R/S/E/OR/AS > G/S/C/HG/SS = D/P/Pt > B/W > B2/W2 > X/Y, with the CORE timeline being Y = E > C = Pt > B > B2 > Z (or W > W2 and assuming there will be a Z similar to the previous “most complete” stories). OR/AS, notably, is basically a reboot in a parallel world where Mega Evolution has been around from the start and we will probably see this alternate timeline continued in a Gen IV remake, and so on. This Multiverse explanation also gives them a great reason to remake titles starting with ORAS in the first place, since the other remakes were due to substantial changes in the mechanics, which basically made the first 2 generations incompatible and part of an entirely separate parallel world. Now with this new explanation, they can remake the other games, include Mega Evolution and the whole Hoopa thing, and give us some novelty, expanding further on the story and bringing in new mechanics in the old timeline, possibly building on things we took for granted or didn’t question in the older titles, like Arceus’ role in the creation of the world, its methods, Mew’s relation to it, more details about how Pokemon replicate, and so many more things we just accepted as facts at some point. I also wanted to point out Pokemon Conquest might take place during or at least in some sort of connection to the supposed war shortly before the CORE timeline, you know, the one the Pokemon War Theory talks about, the one which killed most adults in Kanto prior to the events in RGBY. Alright, here’s one for you, I know I was here a long time ago but I’ve gotten knowledge. If you watch the Mega Evolution Special III (Primals) You see that Lysandre is still alive. This would indicate, that going with timeline flow…The events of ORAS happened BEFORE the events of XY. only reason I say this is because when Lysandre gets the Stone from Mega Rayquaza in the anime he says “Now my plans for a better world can finally come to fruition” or something like that. (I don’t know, “I will create a better world” cliche +1 Sin!). This would also explain how Team Flare got the legendary Kalos pokemon to begin with, with the Stone in their possession, they could easily use it to track down the legendary pokemon needed to power the death-machine in XY. Now the only thing that this doesn’t address, is the new Mega-Evolutions in ORAS that aren’t in XY…though with this I think I’ve given you a big enough migraine. haha not too big a migraine. Well i haven’t seen the film yet but i’ll definitely check it out. ALTHOUGH, my theory right off the bat is that perhaps it sets up a new plan by Lysandre? I feel X&Y-2 will be the next game, or Z. Either way, that will take place post XY so it could explain everything. So it’d be XY->ORAS->Z. Though again, I havent seen the film yet so can’t say. But it is also important to remember that the anime and games aren’t necessarily the same universe. Fan made time line as Nintendo never confirmed anything other then obious b&w2 take place after black and white. I have my own personal time line. Idk I feel like current games all take place in same world but I also theorize there are cousins in this world that have similar names thiugh anime takes place in same world but diffrent demision as does the magna. Back on track of games I feel like the remakes it have been few yrs sence original such and such adventured in such and such and the world has changed as time went on and soe younger cousins with similar or same names came along to have own adventure. I feel like Zina was like referring to other forms of media but that’s just my brain. Or if want to be really crazy you can pretend remakes are the children of the orginal. Well it kinda is confirmed since one of the lead Pokemon people released it. Not really Nintendo’s call. And no, Zinnia was referring to Ruby/Sapphire – the world of Hoenn where there was no Mega Evolution. It explains why Mega Evolution exists in some and not others, since many stories show it as a long held tradition/established point of evolution for the elite. …You’re bringing the anime into the timeline? Would not the anime take place in an entirely different universe? Besides, has there been anything saying the anime is in the same world as the game? So here’s my hypothesis: Kalos and Kanto are alternate universe counterparts. Remember, in the original games, R/S/E linked to FR/LG. Instead, ORAS links with X/Y. Also, in X/Y you don’t get your starter from the professor, when you meet him, he gives you a Kanto starter. Further more, all of the R/G/B/Y legendary pokemon are in X/Y, the three birds and mewtwo. So why is Kanto Kalos? The death beam. What if the impact of that catastrophe changed the tide of the war for one side? What if, without it, the other side won? Now on the matter of the new timeline, I disagree, I would say X/Y and OR/AS are happening at the same time. Now it’s been a while since I did my playthrough of OR/AS, but I don’t remember any dialogue that indicates that it takes place after X/Y. Now, as I write this, there are two new games on the horizon, Sun/Moon. These will be the games to either prove or disprove my hypothesis. To prove my hypothesis, the new region would have to be to kalos what johto is to kanto, so the two would be connected, and you could go through the kalos league. Further more, it should provide the johto starters on top of the new starters in a similar fashion as X/Y, also capable of mega evolution. Now there could be a lot done with this if we can go back to Kalos. How? I seem to recall a kalos legendary getting new forms but no game. That could be the a part of the plot when the game takes us to kalos. Think about it, in S/G/C, we fought the remnants of rocket, this time it could be the remains of flare. Also, Lysandre’s fate is actually ambiguous depending on the version. In X, his last words are along the lines of “Let us all be cursed with immortality.” and in Y “Let us all be destroyed.” So what if he returns, but depending on the version, his appearance, goals, and personality are totally different. The lysandre from X has become some sort of godly being, while the one from Y barely survived and is now on life support. In order to do this, versions would have to be specifically tied to each other, such as x-sun and y-moon. Now in S/G/C team rocket’s plan to bring back giovanni failed, but what if team flare succeeds in finding lysandre at the end of their involvement in the new region, then fall back to kalos after thwarting their schemes. Then as you go through Kalos, you deal with them as they take control of Zygarde, which awakens due to the events of OR/AS when groudon and kyrogre go primal.